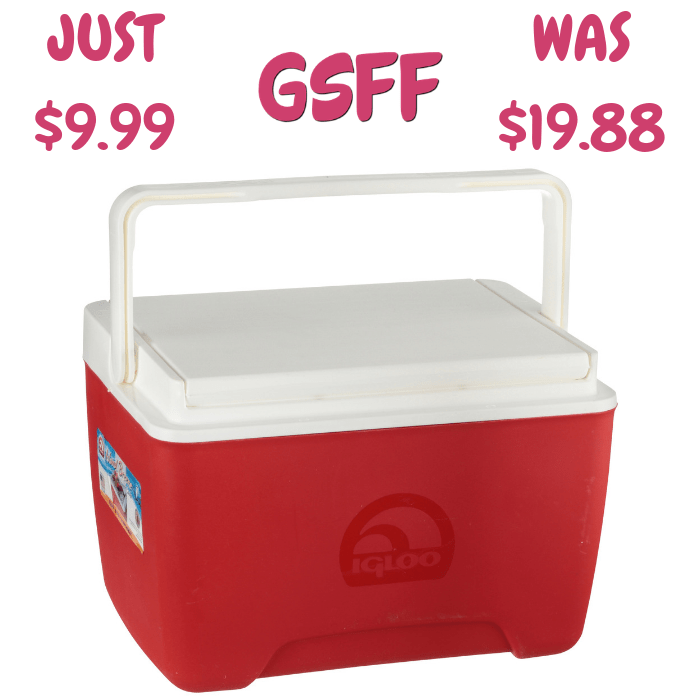 Igloo 9-Quart Cooler Just $9.99! Down From $20! Shipped! You are here: Home / Great Deals / Amazon Deals / Igloo 9-Quart Cooler Just $9.99! Down From $20! Shipped! Amazon has this Igloo 9-Quart Cooler on sale for just $9.99 down from $19.88 PLUS FREE shipping! Stay hydrated on your next adventure with this Igloo 9 qt Island Breeze Cooler. It’s made of sturdy plastic with Cool Riser Technology that helps improve cooling performance and has a 13-can capacity. This 9 qt cooler features a reversible lid that easily converts into a handy tray with a built-in cup holder. You can use it for activities including camping, hunting and fishing trips, tailgating parties, parks, picnics and for travel. It comes with an attached swing up bail handle for convenient access and transporting. The collapsible handle also allows you to stack several together for space-saving storage. This Igloo 9 qt Island Breeze Cooler comes in a variety of colors to suit your needs.